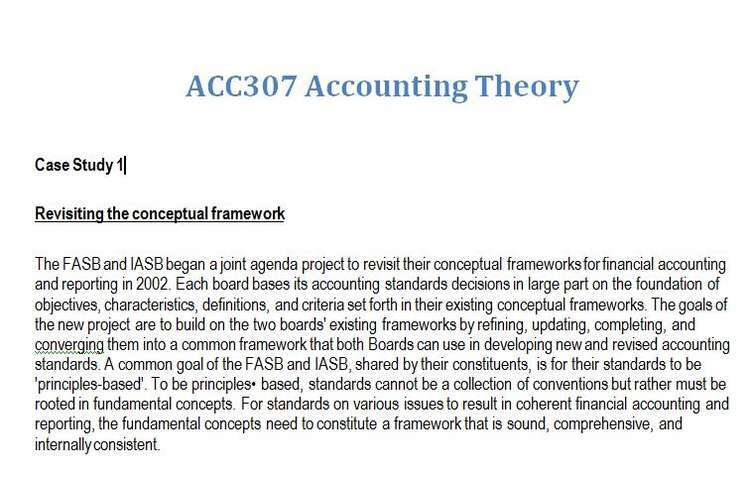 The FASB and IASB began a joint agenda project to revisit their conceptual frameworks for financial accounting and reporting in 2002. Each board bases its accounting standards decisions in large part on the foundation of objectives, characteristics, definitions, and criteria set forth in their existing conceptual frameworks. The goals of the new project are to build on the two boards' existing frameworks by refining, updating, completing, and converging them into a common framework that both Boards can use in developing new and revised accounting standards. A common goal of the FASB and IASB, shared by their constituents, is for their standards to be 'principles-based'. To be principles• based, standards cannot be a collection of conventions but rather must be rooted in fundamental concepts. For standards on various issues to result in coherent financial accounting and reporting, the fundamental concepts need to constitute a framework that is sound, comprehensive, and internally consistent. Without the guidance provided by an agreed-upon framework, standard setting ends up being based on the individual concepts developed by each member of the standard• setting body. Standard setting that is based on the personal conceptual frameworks of individual standard setters can produce agreement on specific standard- setting issues onf y when enough of those personal frameworks happen to intersect on that issue. However, even those agreements may prove transitory because, as the membership of the standard-setting body changes over time, the mix of personal conceptual frameworks changes as well. As a result, that standard-setting body may reach significantly different conclusions about similar (or even identical) issues than it did previously, with standards not being consistent with one another and past decisions not being indicative of future ones. That concern is not merely hypothetical: substantial difficulties in reaching agreement in its first standards projects was a major reason that the original FASB members decided to devote substantial effort to develop a conceptual framework. Another common goal of the FASB and IASB is to converge their standards. The Boards have been pursuing a number of projects that are aimed at achieving short-term convergence on specific issues, as well as several major projects that are being conducted jointly or in tandem. Moreover, the Boards have aligned their agendas more closely to achieve convergence in future standards. The Boards will encounter difficulties converging their standards if they base their decisions on different frameworks. The FASB's current Concepts Statements and the IASB's Framework, developed mainly during the 1970s and 1980s, articulate concepts that go a long way toward being an adequate foundation for principles-based standards. Some constituents accept those concepts, but others do not. Although the current concepts have been helpful, the IASB and FASS will not be able to realise fully their goal of issuing a common set of principles-based standards if those standards are based on the current FASS Concepts Statements and IASB Framework. That is because those documents are in need of refinement, updating, completion, and convergence. The planned approach in the joint project will identify troublesome issues that seem to reappear time and time again in a variety of standard-setting projects and often in a variety of guises. That is, the focus will be on issues that cut across a number of different projects. Because it is not possible to address those cross-cutting issues comprehensively in the context of any one standards-level project, the conceptual framework project provides a better way to consider their broader implications, thereby assisting the boards in developing standards-level guidance. As noted in the chapter, the boards have issued and received comments on an exposure draft relating to Phase A Objectives and Qualitative Characteristics. A discussion paper relating to Phase D Reporting Entity had been issued and work is continuing on Phase B Elements and Recognition and Phase C Measurement. What is meant by a 'cross-cutting' issue? Suggest some possible examples of cross•cutting issues. Critics contend that GAAP is seriously flawed. Some in the accounting profession go so far as to pronounce financial statements almost completely irrelevant to the financial analyst community. The fact that the market value of publicly traded firms on the New York Stock Exchange is an average of five times their asset values serves to highlight this deficiency. Many reformers, including FASB chairman Robert Herz, believe that fair value accounting must be part of the answer to making financial statements more relevant and useful.Advocates of fair value accounting say it would give users of financial statements a far clearer picture of the economic state of a company. But switching from historical cost to fair value requires enormous effort. Valuing assets in the absence of active markets can be very subjective, making financial statements less reliable. In fact, disputes can arise over the very definition of certain assets and liabilities. Each side agrees that relevance and reliability are important, but fair value advocates emphasize relevance, while historical cost advocates place greater weight on reliability. The qualities that distinguish "better" (more useful) information from "inferior" (less useful) information are primarily the qualities of relevance and reliability ... The objective of accounting policy decisions is to produce accounting information that is relevant to the purposes to be served and is reliable. Some critics also interpret reliability as having a meaning that differs in at least certain respects from how that term is defined in the FASB's Conceptual Framework. Some critics equate reliability with precision, and others view it principally in terms of verifiability. However, Concepts Statement No. 2 defines reliability as "the quality of information that assures that information is reasonably free from error or bias and faithfully represents what it purports to represent." With respect to measures, it states that "[t]he reliability of a measure rests on the faithfulness with which it represents what it purports to represent, coupled with an assurance for the user, which comes through verification, that it has that representational quality." Thus, the principal components of reliability are representational faithfulness and verifiability. Although there are reliability concerns associated with fair value measures, particularly when such measures may not be able to be observed in active markets and greater reliance must be placed on estimates of those measures, present-day financial statements are replete with estimates that are viewed as being sufficiently reliable. Indeed, present day measures of many assets and liabilities (and changes in them) are based on estimates, for example, the collectability of receivables, salability of inventories, useful lives of equipment, amounts and timing of future cash flows from investments, or likelihood of loss in tort or environmental litigation. Even though the precision of calculated measures such as those in depreciation accounting is not open to question since they can be calculated down to the penny, the reliability of those measures is open to question. Precision, therefore, is not a component of reliability under Concepts Statement No. 2. In fact, Concepts Statement No. 2 expressly states that reliability does not imply certainty or precision, and adds that any pretension to those qualities if they do not exist is a negation of reliability. What you think is the fundamental problem with financial statements based upon the historic cost measurement principle used under US GAAP ? Around the world, companies are being required to meet higher levels of disclosure of environmental liability ... In the United States, for example, the US Financial Accounting Standard Board (FASB) issued provisions in 2002 for accounting for environmental liabilities on assets being retired from service. The provision for accounting for asset retirement obligations required companies to reserve environmental liabilities related to the eventual retirement of an asset if its fair market value could be reasonably estimated. The intent of the ruling was disclosure, but the conditional nature of estimating a fair market value caused corporations to take the position that they could defer their liability indefinitely by 'mothballing' a contaminated property. Companies effectively postponed the recognition of their environmental liabilities in the absence of pending or anticipated litigation. As a result of what may seem like a minor technical re-interpretation, companies may have to recognise immediately millions of dollars in liabilities in their income statements to comply with this change. In Europe, regulators have also initiated efforts to promote disclosure. In 2001, the European Commission promulgated tougher, non-binding guidance for disclosing environmental costs and liabilities, and various countries in Europe have issued additional requirements related to environmental disclosure. In 2002, the Canadian Institute of Chartered Accountants published voluntary guidance that stressed the importance of disclosing all material risks, including environmental liabilities, in companies' annual reports. Some financial institutions have also pledged to adhere to tenets of international initiatives such as the Equator Principles, which factor environmental and social considerations into assessing the risk of a project. Also, a group of pension funds, foundations, European investors and US state treasurers have endorsed UN efforts to promote a minimum level of disclosure on environmental, social and governance issues. Recognition of environmental liabilities may also soon emerge as an issue for companies in Asia. While environmental issues may have taken a back seat to rapid economic development over the past 20 years, that situation may change as legislation and regulation catch up with development. The responsibility for disclosing future environmental liability is clearly a growing issue for companies around the world. However, accurately estimating cleanup costs is not an easy task due to unknown contaminants, legacy liabilities related to formerly operated property, regulatory changes or unexpected claims related to natural resource damage. The article states that the US standard setter FASB requires companies to record a provision in relation to environmental costs of retiring an asset ('to reserve environmental liabilities') if its fair value could be reasonably estimated. How do you think companies would go about estimating such a provision?